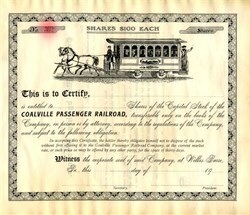 Beautiful RARE certificate from the Coalville Passenger Railroad printed around 1900. This historic document has an ornate border around it with a vignette of a horse railway car with passengers. This item and is over 100 years old and we only know of 5 of these certificates in existence. The Wilkes-Barre and Ashley (Coalville) Passenger Railroad Company was organized June 18th, 1869, under an act of the Legislature approved March 24th, 1868, and a supplement approved April 15th, 1869. The road extended from the junction of Washington and Market streets, Wilkes-Barre, to Ashley, near the depot of the Lehigh and Susquehanna railroad.